One fine day, my friend Hendrik was asking me out for lunch. It was definitely an interesting offer because in my holiday situation, no food served at home. You know, the maids went home for Lebaran holiday. So here we go, heading to a place we’ve been dreaming to visit from weeks ago. WOW! Surprisingly, the crowd is quite crazy! We expected it won’t because holiday mood is still in the air. But the fact is, we have to queue. I was queue-ing like a lost kid and at first, don’t know that we have to pick queue number for easier-tidier way. They’re doing it like Professional! These people queue-d more than half-an-hour just to eat! First thing to notice, they are closed on MONDAY. Phew, lucky me. Out of those random 7 days, i didn’t pick Monday for my visit there. Then i asked my friend Hendrik to queue while i took some pics. I can see the traditional hawker food glass shelf for showing what they got. Can’t hold myself to drool when looking those beautiful variants of suckling pork. The heart of Nasi Babi Guling : SAMBAL! Pleasing for the eyes, those are some highlights that attracts my appetite so much. The real essence of mouth-watering food is the shiny factor : OILY SURFACE! Also the balinese sambal, looks spicy. 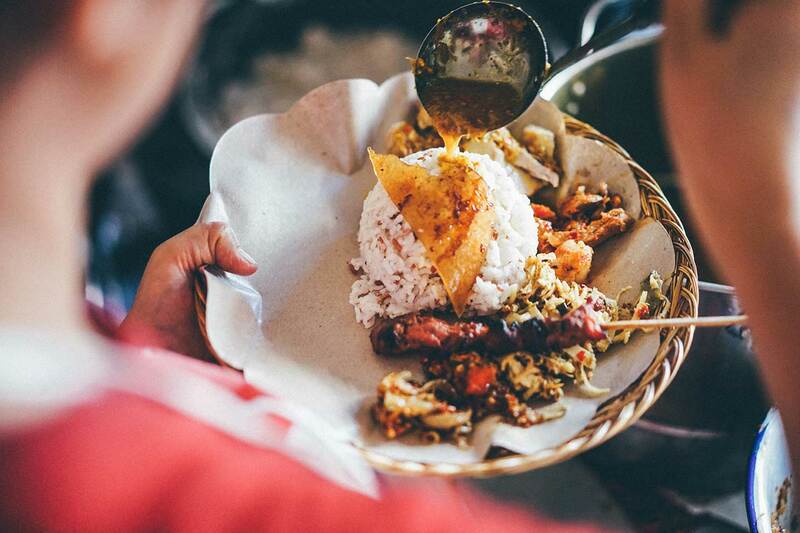 But for me i think it’s still tolerable because what is Indonesian food without spiciness? The lady owner who looks like native Balinese people, served the queue thoroughly. Why am i so sure that she’s the owner? 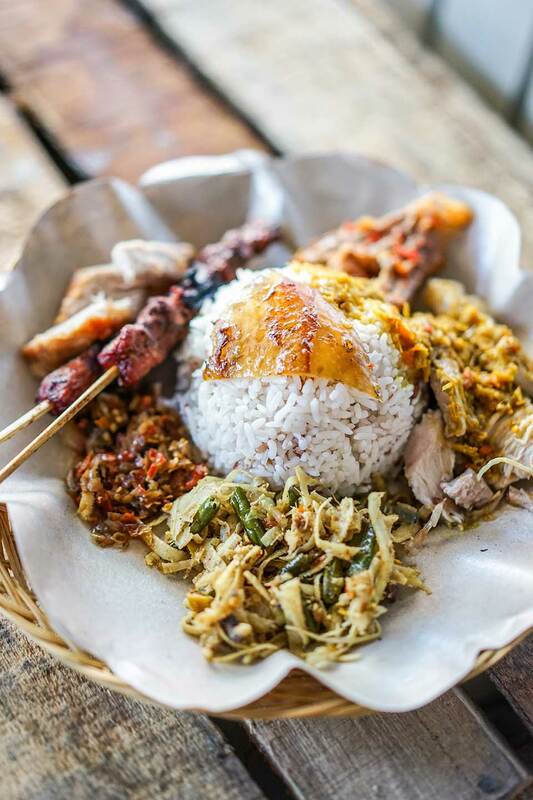 Because most of Indonesian hawker food, especially Bali, usually have their owner serving the customers themselves. Slow but sure, she served everyone until my line comes up. No complain about this. Right served in front of us, me and Hendrik ate like berserk. 40 mins of queue-ing was totally worth it. All their spices were so “Bali”. It’s even better than mainstream Bigul spots in real Bali such as Pak M#len, D#biel, Ibu O#a, etc. These are just too overrated and overpriced for something that didn’t even trigger my appetite. Alright, back to this one. Their skin was real crisp, with small hint of juicy fat sticked to the skin. Their pork meat was so tender, a bit chewy but still easy to munch. Not so hidden, they also give some pieces of crispy-fried pork which is satisfying too. A wise conclusion, will surely give more visit more often. Aside of near to where i live, it is also worth every single bites and every single second queue-ing. Glad Surabaya has this Balinese gem, and i assume it is that good because some touch of Surabaya. Great work. Photos stunning! I wouldn’t expect any less from you. Layout clean. Font pas, asik dibaca. Bagus menjelaskan makanannya oke karena ada touch of Surabaya which is your native tounge. Photo size consistency. Check your portrait orientation photo. Ada beberapa yang nanggung ukurannya. Leaving a lot of weird unused space.